Hi everybody! Ellen Vargo here, back again to share another project. 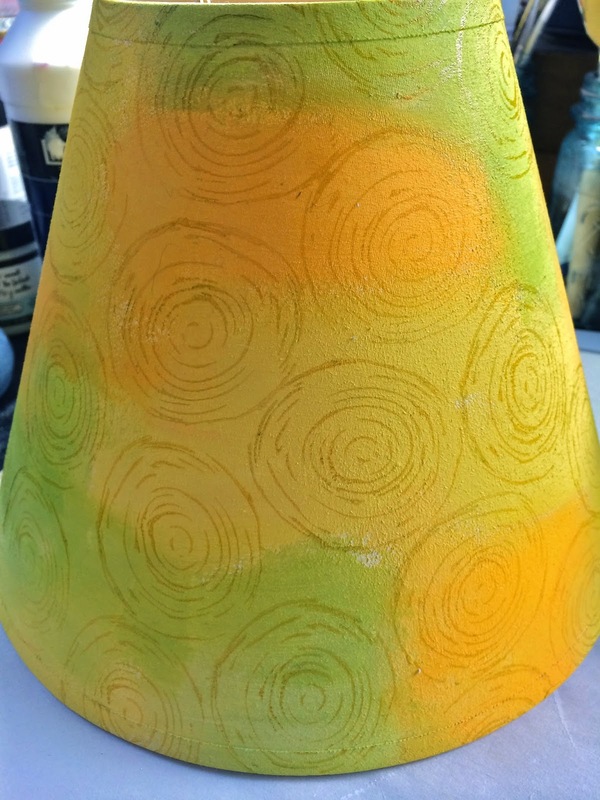 I've drawn a lot of inspiration over the years from Alisa Burke, and she recently shared an altered lamp project so I decided to give it a try. Alisa brings art and creativity to *everything* in her life and her blog is full of ideas. I started with a small lamp I keep on the dresser in my room. 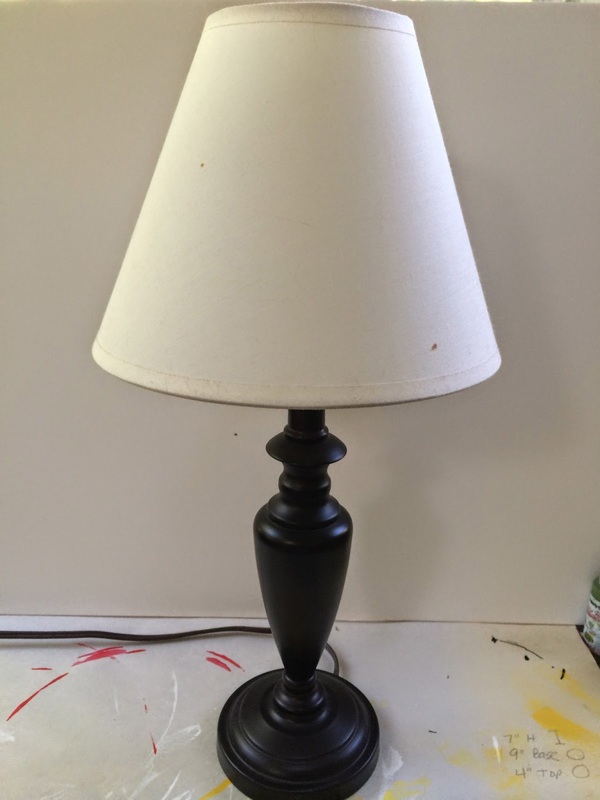 The shade is 7" tall, 9" diameter at the base, and 4" diameter at the top. 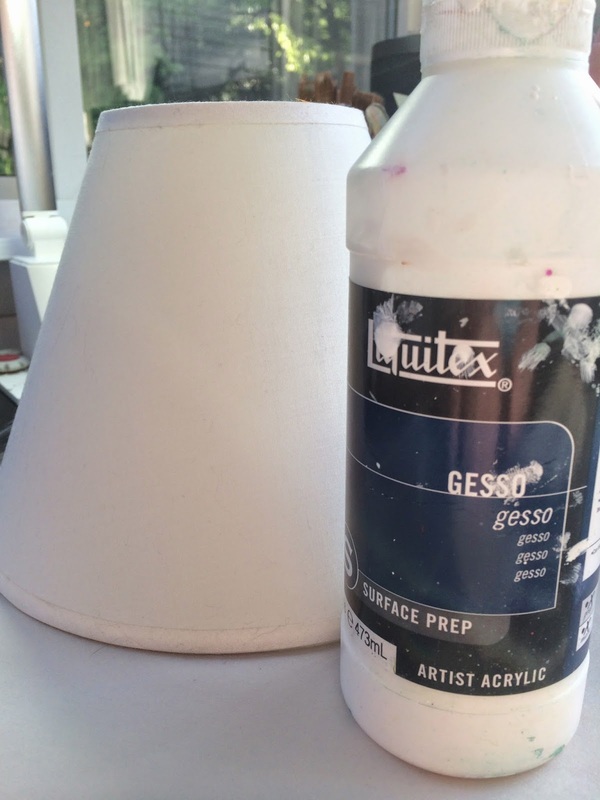 I started by giving the whole shade a coat of white gesso. 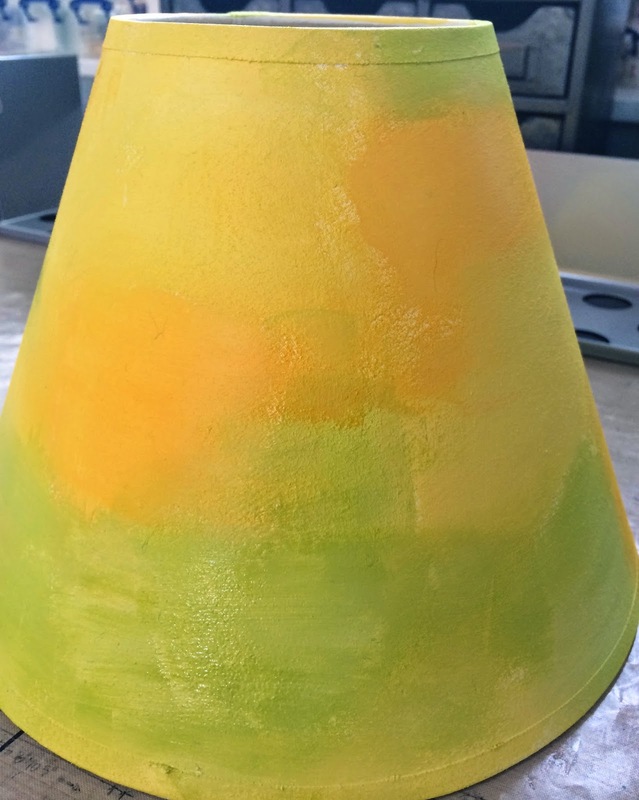 Then I chose three light, bright fresco paints: zesty zing, yellow submarine, and limelight. I started by painting the yellow submarine in random areas around the entire shade. I tried to give roughly equal space at the top, middle and bottom of the shade. Then I filled in the rest of the shade with limelight and zesty zing. Even though the colors are all different, they are all translucent so they do blend quite nicely together. 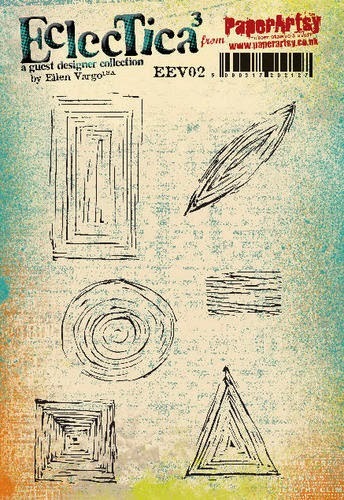 Then it was time to choose a background, and I'm sure it will come as no surprise that I chose one of my scratchy shapes from EEV02 - the scratchy, swirly circle - a definite favorite for backgrounds! 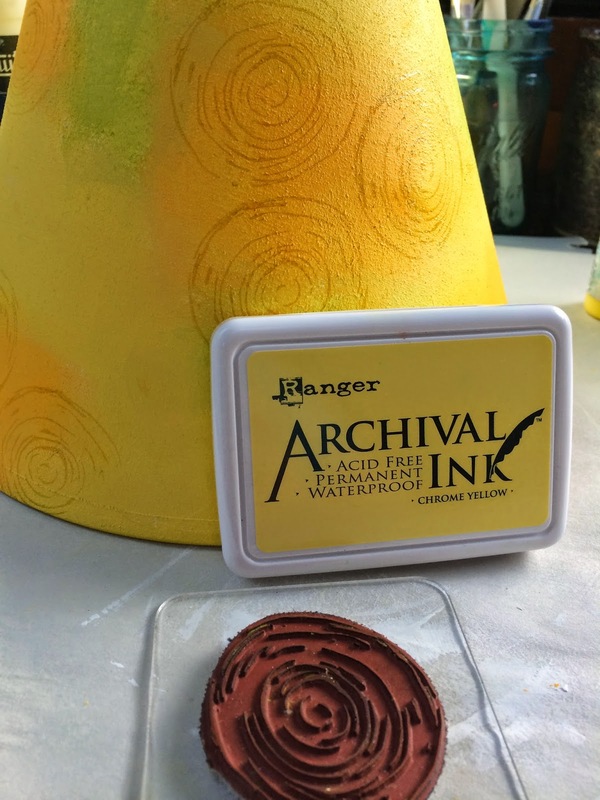 I used chrome yellow archival ink to stamp the circle around the entire shade. I put my non-stamping hand on the inside of the shade to provide a firm base for stamping. I had a few images smear a little bit, but overall it worked quite nicely. Then I used my favorite script tissue paper to glue torn strips all around the shade using Glue 'N' Seal (matte). Matte multi medium would work beautifully for this, too. When the script was dried, the shade needed something more... so I used London Bus fresco paint, watered down on the craft sheet, to do some red drips all the way around... and here's the final result. And... drumroll.... here is the "after" pic! And here's a shot with the light turned on. I love the way it glows! This was a very simple project and I love the results. Hope you decide to give it a try. You could mix and match the scratchy shapes in the background, but I tend to go for simplicity. 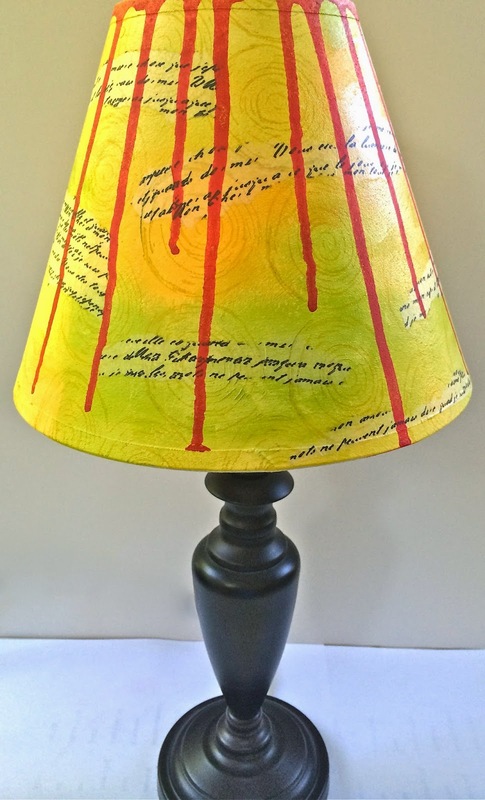 Whatever your design style - this is a great way to just go a little crazy and literally LIGHT UP your art! Have fun playing! A huge thanks to Ellen from PaperArtsy HQ. Wow, what a transformation. 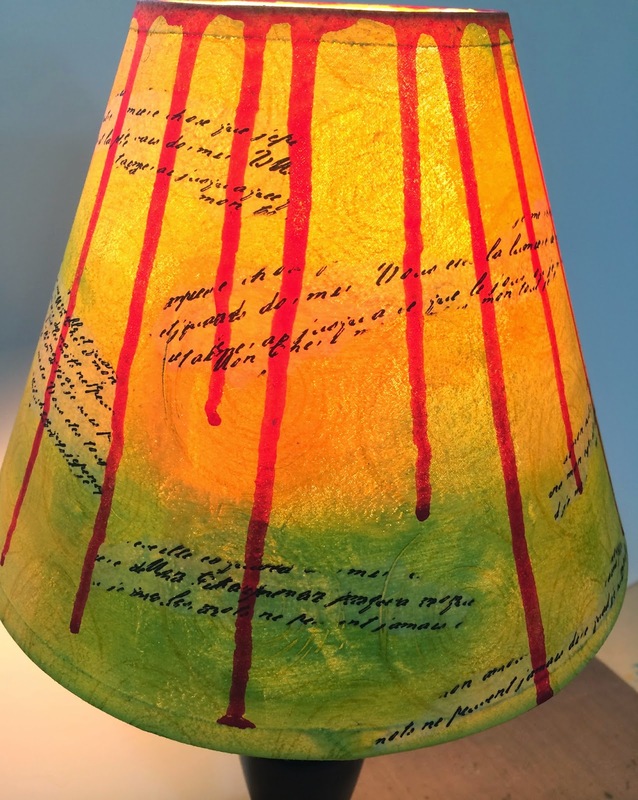 We love how the warm glow brings those paints to life. With all these wonderful paints and stamps in our stash we can all get into home decor. The possibilities are endless. what a fabulous project, Ellen!! love the bright colours and the stamping looks great too. Believe it or not, but I had planned to transform a shade and bought one from that swedish shop. I didn't come up with any ideas but now I have no more excuses! LOve this idea...great colour combo too! What a great project will have to keep this in mind!! !